A man holds the tail of a tethered milking cow whilst blowing up its uterus to help it produce milk. This was often done for cows whose calf had died, in combination with a tulchan made from the dead calf's skin placed next to the cow for it to smell. A boy holds the cow's head whilst a woman attempts to milk the cow, since milking by men is forbidden and considered dangerous to their health. Note on print reverse ms pencil - "43 5 A62" & print front border ms ink - "NUER VIII/10"
Morton, Chris. 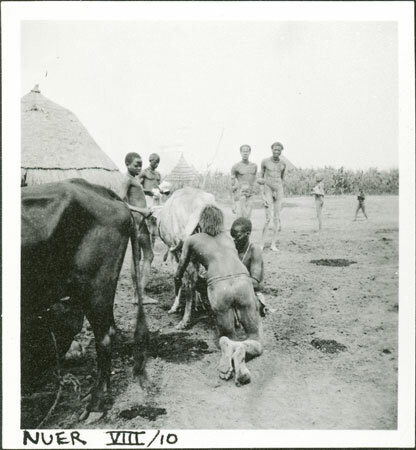 "Treating Nuer cow" Southern Sudan Project (in development). 03 Jan. 2006. Pitt Rivers Museum. <http://southernsudan.prm.ox.ac.uk/details/1998.355.352.2/>.